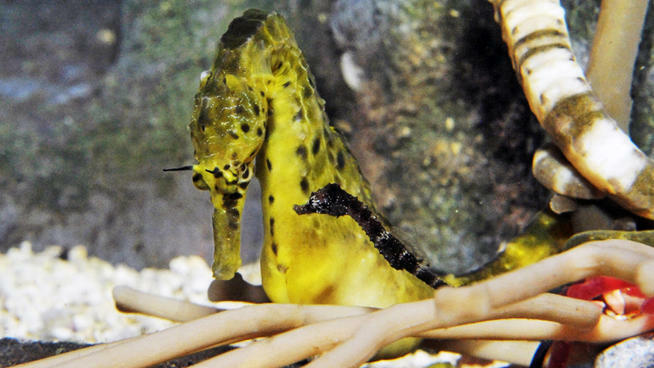 Pot-bellied seahorses have been successfully breeding at the NY Aquarium further strengthens the endangered species. This species of seahorses have a long history in traditional medicines which coupled with the pet industry has led it to near extinction. Currently the sales of the pot-bellied seahorse are prohibited under the Convention on International Trade in Endangered Species (CITIES) of Wild Fauna and Flora. With the new breeding program showing signs of success we may see tank raised specimens hitting the market in the coming years. The pot-bellied seahorse is one of the larger seahorse growing to a shocking 13.5 inches making it a nice specimen in home aquariums. More on the breeding program can be read here.